This 42" Bariatric air mattress system provides both comfort and therapy. Packed with features this 42" alternating pressure mattress is designed to heal up to and including stage 4 pressure sores. This pressure relief mattress includes a digital push button pump with adjustable cycle times. The alternating air pump supports up to 750 lbs and offers comfort and effective healing therapy for bariatric patients. 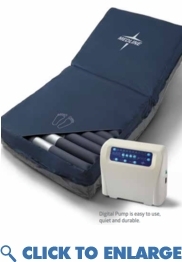 The bariatric air mattress includes the patented cell within a cell design that prevents the patient from bottoming out during power failures. This alternating pressure mattress is identical to the models used in hospital and nursing homes. This bariatric mattress system is designed to protect the patients skin, reduce painful pressure points while stimulating blood flow to heal and prevent bed sores. Functions include Alternating pressure therapy allowing the cells to inflate and deflate under various cycle times. This gives the patient the ability to control the inflation and deflation of the cells. ( setting the alternating to 10 minute, 15 minute, 20 minute or 25 minute adjustable cycles.) The ability to change cycles increases blood flow and assists with pain management. The on-demand static float allows the patient to suspend the alternating process. This allows the caretaker to transfer the patient easily without injury. Low air loss therapy circulates airflow within the trunk and pelvis area of the patient. This manages heat and moisture protecting the patients skin from break-down. The low air loss feature circulates air flow under the cover as the mattress is in its alternating cycle. This dual therapy assists in the treatment and prevention of bedsores and pressure ulcers. (Heals stages 1-4) The Low-shear, low-friction cover is easy to clean and fully encases the air cells protecting the mattress from fluids or incontinence. Fits on bariatric hospital bed frame or retail box spring. Operates and alternates from an elevated position. Free Fast Shipping on This 42" Bariatric Air Mattress Now! The alternating air pump supports up to 750 lbs and offers comfort and effective healing therapy for bariatric patients. The bariatric air mattress includes the patented cell within a cell design that prevents the patient from bottoming out during power failures. This alternating pressure mattress is identical to the models used in hospital and nursing homes. This bariatric mattress system is designed to protect the patients skin, reduce painful pressure points while stimulating blood flow to heal and prevent bed sores. Functions include Alternating pressure therapy allowing the cells to inflate and deflate under various cycle times. This gives the patient the ability to control the inflation and deflation of the cells. ( setting the alternating to 10 minute, 15 minute, 20 minute or 25 minute adjustable cycles.) The ability to change cycles increases blood flow and assists with pain management. The on-demand static float allows the patient to suspend the alternating process. This allows the caretaker to transfer the patient easily without injury. The Low-shear, low-friction cover is easy to clean and fully encases the air cells protecting the mattress from fluids or incontinence. Fits on bariatric hospital bed frame or retail box spring. Operates and alternates from an elevated position. Free Fast Shipping on This 42" Bariatric Air Mattress Now! Full XL Bariatric Alternating Mattress System 80" X 54" X10"
Queen Bariatric Plus Alternating Pressure Mattress 60"